Home→Dolls with Wispy, Painted Hair→Rules, Guidelines, and Parameters, Oh My! Not being a fan of rules, I sure seem to have a lot of them when it comes to costuming my dolls. And I have a lot fewer of them than many more stringent historical costumers. The antique doll costume police may not agree with my rules, but I’m okay with that. When I decided to write my list of do’s and don’t’s, it made me rather sad to have so many of them. But then I remembered my college art classes. Most of our assignments challenged us to solve a problem. We were required to create something that was our own design, but which fit within the (sometimes narrow) parameters set out by the teacher. *Antique dolls were often dressed in remnants of people clothes, so the patterns and trims were often over scale, but can look charming. It is challenging to make over-scale patterns work well on tiny dolls. **Did you know that before 1900, hooks on clothing had 2 prongs, not 3 like the modern ones? If you find a doll’s dress with 2-prong hooks, it doesn’t necessarily mean it is old, but it can be one clue. ***Elastic was not used in clothing until around 1910. It was used in shoes and boots in the 19th century, but not clothing. Draw inspiration from antique doll costumes, antique fashion plates or antique people clothing. Don’t over design it. Know when to stop. The home sewing machine was patented in the 1850’s, so antique doll costumes were sometimes made by machine. Even though I prefer to sew them by hand, it is perfectly fine to sew by machine. I strive to make my dolls look like they may have looked in a doll shop when they were new. However, I don’t like to use stark white fabrics, so I usually over-dye whites with coffee. If colored fabrics look too vivid, coffee dying can help them too. Avoid spray starch. It can attract pests. I do use new straw hats, but I usually alter them. Sometimes I even paint them. I pre-wash many fabrics, even silks. Partially wetting or drops of water on silk can leave spots, but if it is evenly wet and dried, it won’t get spotty. Washing newer fabrics removes the factory sizing and softens the fabric. Softer fabrics drape better. Washing old fabrics not only cleans away harmful dirt, but can tell you if it will hold up to the manipulation needed to make a garment. If I want the fabric to have a crisp look, then I don’t wash it. I think that’s it. And yes, I do break my own rules. Often. Do you work within different guidelines? Do my guidelines make sense to you? Thank you for the picture of old hook and eyes! 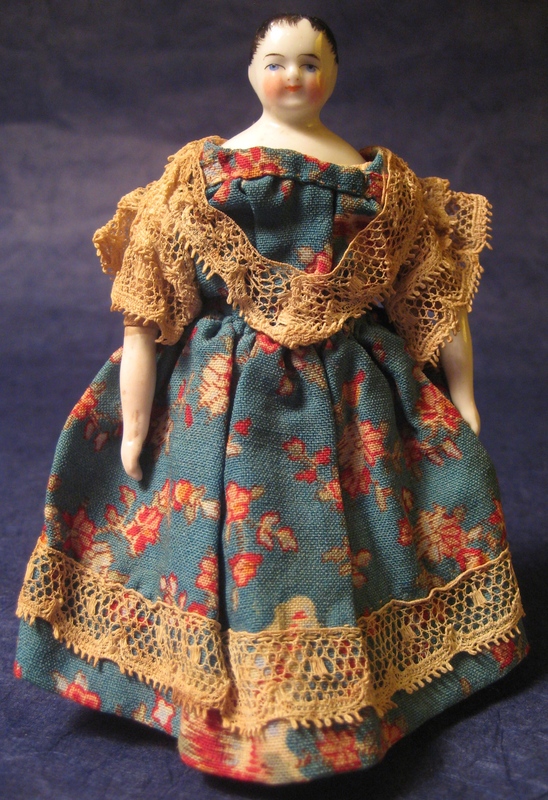 I purchased a lovely linen dress for my 22″ Schoenhut doll that needs “new” hook & eyes. I found a set of very old ones still on the card in my sewing basket! I can confidently use those on the dress.